This column was written by Suzy Khimm of the New Republic. If Senator Orrin Hatch is a liberal-friendly health care reformer, he's working under some pretty deep cover. Just two months ago, Hatch voted against the reauthorization of the State Children's Health Insurance Program (SCHIP), protesting the inclusion of legal immigrants and higher-income children as a "partisan exercise." When President Obama released his budget proposal, Hatch warned that health care reform under his administration's watch could be a nightmare. "[T]his reckless budget will swamp Americans in a morass of debt and mortgage the future of our children and grandchildren," the Utah senator thundered in a press statement. Hatch's remarks echoed his scathing criticism of the stimulus bill, whose health provisions he denounced on the Senate floor as the "Socialized Health Care for All Act of 2009." 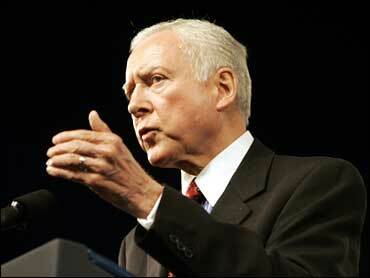 But Hatch's Senate colleagues have noticed some disparities between his public fulminations and his private actions. Four days before railing against Obama's budget, Hatch was standing with his fellow legislators on the Senate floor, shortly before the call to walk over as a group for the president's joint address to Congress. He took the time to speak to Democratic Senator Max Baucus, chairman of the Finance Committee, and said that he wanted to help him push for a bipartisan consensus on comprehensive reform. "What Hatch telegraphed was, 'I'm in the fundamental reform camp, I want to do something big,'" says one senior Democratic staffer. "You've made a commitment to work together." When I talked to Hatch last week, he brushed off the Baucus incident as a routine conversation with a Democratic colleague. "I work very hard to accommodate people," he said. But, in fact, further conversations with Hatch and health care advocates on the Hill and beyond have suggested a very personal, profound reason why Hatch may be throwing his powerful weight behind "Socialized Health Care": his decades-long friendship with Ted Kennedy, the ailing patriarch of the universal health care movement. "I would like to do [health care reform] as a legacy issue for [Kennedy], if I can--this would mean a lot to him," Hatch told me. Hatch and Kennedy first came together as adversaries on the Senate Labor Committee in 1977, where Hatch--an accomplished off-duty songwriter--jokes that he damaged his singing voice from wrangling over labor-law reform with his liberal colleague. Within a term, though, the two learned to compromise, and their ensuing friendship became part of Washington lore. "Sometimes I've been the chairman, sometimes he's been my chairman," Kennedy says. "But we've always been able to work together." Hatch recounts the early antics of Washington's "legislative odd couple" with a teasing, domestic familiarity. Before smoking was banned, Kennedy would regularly puff away at cigars in the committee room, much to the dismay of his Mormon colleague. "You could normally tell whether we were fighting by the amount of smoke he would send my way," Hatch writes in his autobiography. "If our differences were great ... Ted would lean back in his chair, puffing away, knowing he was giving me a headache that was more than just political." Hatch had his own way of needling Kennedy when he wanted to press him on an issue: He'd threaten to call Kennedy's sister, Eunice Kennedy Shriver, who was also a close friend of his. "If he'd get reluctant, I'd say, 'OK, Teddy, I'm going to go see Eunice,'" Hatch told me. "And then she'd tell [Kennedy], 'Don't you dare mistreat that nice young senator!'" Conservative detractors soon claimed that it was Kennedy who had gotten the better half of the relationship, watching as Hatch repeatedly bucked the expectations of his own party to enable Kennedy to achieve legislative breakthroughs on workplace privacy, federal support for child care, and civil rights for the disabled. And, largely because of Kennedy's particular passion for health care, Hatch has time and again broken with his party in this arena. From his early years in the Senate, he has prided himself for being able to forge bipartisan deals on health care, including the Hatch-Waxman overhaul of the Food and Drug Administration in 1984 and, with Tom Harkin, the first broad-reaching regulation of dietary supplements a decade later. But working with Kennedy has brought Hatch to new heights on liberal health care legislation. In 1995, Hatch took on Jesse Helms in a Kennedy-led effort to provide emergency aids funding, breaking a political impasse and ushering in enough Republicans to pass the bill. Two years later, Kennedy wooed Hatch to support a children's health insurance bill that covered the working poor through a cigarette tax--at times literally serenading him in the Senate halls with music. Hatch was won over, explaining at the time that he supported the legislation to prove that the Republican Party "does not hate children." Nevertheless, Hatch's underlying conservatism on health care has not, by and large, been affected by his friendship with Kennedy, and he has regularly blasted more ambitious expansions of government-run health programs. In 1994, for example, when Kennedy introduced a health care bill modeled on the president's proposal for universal coverage, Hatch attacked it as "nothing more than a pasteurized version of Clinton's blueprint for socialized medicine." Given this, and given Hatch's powerful spot as one of the few Republicans on both the Finance and the Health, Education, Labor, and Pensions committees--the bodies with key jurisdiction over health care--Democrats in the current Senate feared that Hatch would be less than enthusiastic about passing comprehensive reform, watching him blast Obama's stimulus as a "Trojan Horse" for socialized health care and vote against the reauthorization of his own children's health act. "We were worried," admits a senior health care policy adviser to Baucus, describing the concerns over the SCHIP vote. But Kennedy's terminal brain cancer seems to have changed everything. If Hatch's deep-abiding affection for Kennedy has plunged him into the most ambitious legislative deals of his career, the prospect that universal health care will be Kennedy's last defining act in Congress has pushed Hatch into the fray with a far more urgent zeal. Hatch has now become actively involved in the initial deliberations--despite his recent friction with Democratic legislators. "I resented the way [the Democrats] modified CHIP ... but, as important as CHIP is, this is even more important," Hatch told me. "I'm prepared to work on a final bill right now." To the relief of Democratic policymakers, Hatch has not only put aside his anger about SCHIP, but also suggested that he wants to take a central role in crafting a grand compromise, setting his sights on achieving "seventy-five or eighty votes" in the Senate. And he's doing it all for Teddy: These days, when Hatch confers with his colleagues, Kennedy's name has become something of a mantra. "The one thing that comes to mind is how many times [Hatch] talks with great affection about Senator Kennedy," says Senator Ron Wyden. "He very much wants to make this journey to health care reform with Senator Kennedy." Determined to help put a deal together, Hatch has made an all-out push to consult not only Republican-friendly stakeholders, but also Democrats and liberal policy advisers. "Frequently, it's us trying to reach out to them, and [Hatch's staff] took the first step," said the Baucus aide. "We reached out to many people, and I suddenly heard that Hatch's office wanted to talk," says Len Nichols, a former Clinton health reform staffer and key Democratic proponent of the bipartisan reform effort. "They weren't going to give me an hour unless they were really serious." But Hatch's key role in the push for health care reform could actually involve members of his own party. Hatch isn't the only congressional Republican interested in making some compromises on health care. Senator Chuck Grassley, well known for being a reform-minded crusader, is considering writing a comprehensive bill with Baucus. And Hatch's colleague from Utah, Senator Bob Bennett, has helped convince a handful of Republican senators to co-sponsor the Wyden-Bennett bill, a bold proposal to eliminate the current employer-based insurance system. Nonetheless, within the GOP's pro-reform camp, Hatch is one of the loudest public voices against "Socialized Health Care," which does wonders for his credibility--and the credibility of those Republicans working with him. With Hatch's reputation as a conservative intact, "Grassley has cover--he's not out there by himself doing health reform," says the Democratic Hill staffer. While it won't be enough to sway his most reactionary colleagues, Hatch could bring along a critical margin of Republican support in a legislative fight that might come down to a handful of Senate votes. It's a particularly senatorial way to pay tribute to a dying friend. And this could be Hatch's last chance to do so, since he may himself be leaving the Senate after his current term ends, depending on his own health. Just enough time for one last serenade.